At the conclusion of almost three years of research in the field, participant observation, recorded and unrecorded interviews, I found myself in somewhat of a curious position. 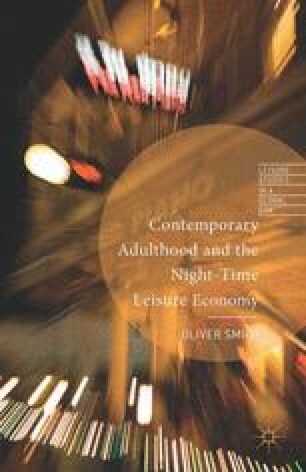 No longer having to immerse myself in the hyperreal of the night-time economy (NTE), my need to maintain contact with the disparate groups of individuals who have provided the data on which this piece of work is based evaporated. Although through the previous months and years I had in effect spread my time between several social groups in order to gain a level of insight into their lives and relationship with the NTE that would simply not have been possible through any other means of data collection, I now found myself choosing my own forays into the NTE with opportunities for data collection featuring much further down my list of priorities. I no longer had the need to follow Julian and his friends into 80s theme bars and a string of Vertical Drinking Establishments that had on a number of occasions I am sure, contributed to a severe headache the following morning. I no longer had to trail Kevin into rough pubs to make illicit drug deals in the dingiest corner of a dingier pub. In short, there came a point when I had no need to see any of these individuals any more. I had collected sufficient data as far as I was concerned to furnish the reader with insight into the lives of contemporary adults and their relationship with the NTE.